There’s no doubt about it, food trucks are the craze. I remember when I was 16 and working a summer roofing job. During lunch, I would climb off the roof and make my way over to the food truck for a bologna and cheese or, if I was feeling adventurous, a burrito. Now I can make my way down to a Friday food truck event and enjoy everything from sushi and Indian curries to vegan delights and Texas Style BBQ. There is no doubt the food truck has come a long way and offers even the most discriminating foodie a variety of gourmet delights. As this business segment continues to grow, so will the need for the insurance industry to adapt and offer these modern entrepreneurs advice and protection for their business. Food truck owners and operators have many unique concerns when looking for insurance protection. Since the food truck industry is really a niche all to its own, food truck owners will find themselves best served by aligning with agents and insurance carriers that understand and specialize in their business. As with any insurance coverage you can always cut corners to save a few bucks, however the results of doing that can be catastrophic to a small food truck business. Simply put, without the right coverage you may find yourself out of the business pretty fast. Your agent and insurance company will want to have a good understanding of your operation so they can help provide the right coverage. Here are few things a carrier may scrutinize about your food truck operation when determining both your eligibility and pricing. In the words of the late great Jimi Hendrix, “are you experienced”? Experience matters a lot to insurance companies. Any company that understands the food truck business also understands this business has a lot of new startup operations and many have been in business less than three years. This does not mean if you’re starting a new operation you won’t be able to find adequate coverage, but it will matter what your prior experience has been. If your background has been several years working in the restaurant or catering industry then you’re off to a good start, but be ready to share your background in detail with your independent agent. If you’re not coming from the food service industry, your agent will really need to understand your career change, business plan, and available resources in much greater detail. If you’re an experienced operator, then a review of your prior loss history, if any, will be conducted. It’s a pretty simple theory, but the more you’re on the road the more chance you have for an accident. I recently read a blog about a food truck operator who had not left his spot in the last 12 years! However, this isn’t the norm. It’s expected your truck will be on the move but exposure for a truck moving three times a week will differ greatly from one moving three times a day. Your agent and insurance company will want to have a good understanding of your operation from your preparation practices to hours and locations. Your agent will need to know the condition of, cost of, and special equipment associated with your truck or trailer. Will you be using propane? Do you have a proper ANSUL (fire suppression) system? What other items are permanently attached to your truck? Are you operating just as a food truck or are you also catering? Will you be serving alcohol or are you interested in expanding to offer it? You may need liquor liability. Are you accepting cash? Are you protected in the event of a robbery? If you suffer a loss, how long will you be able to last with the loss of your business income? How soon would you be able to be up and running again? Will you have a home office or other location for a business office or commissary to prepare food? What are your exposures at these locations? Will you have staff or bring on extra help as needed, and will that require workers’ compensation insurance? What other requirements or limits will a certain event holder or venue require? Will there be an umbrella, workers’ comp or additional insured requirement that will need to be addressed? How much could you afford to financially deal with a food contamination or spoilage issue? It’s important to align yourself with a good independent agent that understands your business. Each operator’s situation may differ so look for an agent and company that will help tailor a policy that best addresses your unique needs. One more thing you may want to consider is what services are offered from your agent and or insurance carrier. You’re literally on the go so it may be important for you to have options like EFT payment plans or online policy access. The ability to go online and print your certificates of insurance for an event could come in handy. And a good loss control program is a great benefit. These added values can go a long way in helping you save time and money. 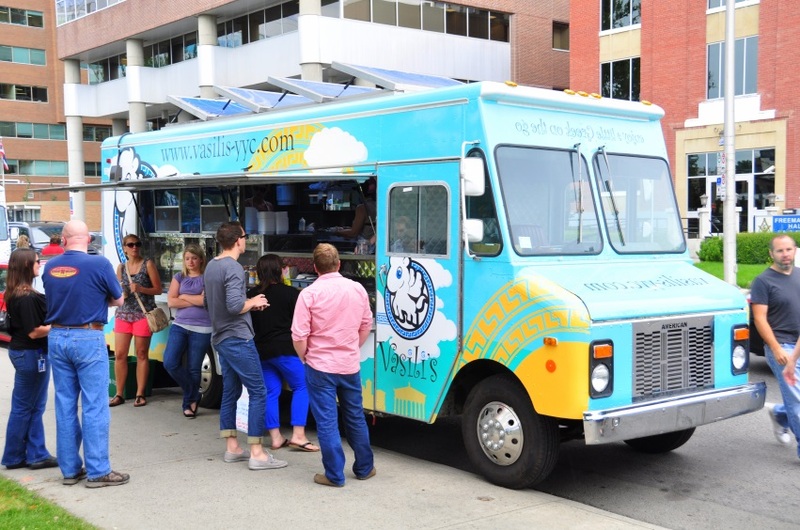 I’m thrilled to see food trucks flourishing and will continue to support this emerging industry, not only as an advisor on insurance but also an admitted foodie, one delicious bite at a time. Nice article Matt! I tweeted the link a couple of times! Thank you Bill, appreciate the tweets as well!